The blackjack rules goes deep into blackjack origins. Blackjack games go by the same guidelines no matter how many decks of cards you have or how many people are playing. On the internet, blackjack games are usually programmed with two decks of 52 cards. Otherwise, it's quite common to use four to six. Although all you need for playing a Blackjack game is a dealer and his/her opponent, five to seven people commonly play at once. All players receive just two playing cards to begin with. Everyone wants to have a higher total than the dealer by the end of the game- without going over 21. Number cards are worth face value, face cards 10, and an ace alternates with the hand number- it will either have a value of 1 or 11. For those who are lucky enough to receive a first set of a natural or two cards valuing 21 points, they collect 150% of their first bet. Once they get their cards, players decide what move to make- double down, hit, split, surrender, stand, or take insurance. Below is an explanation of each. Hit-Another card is dealt to add to the player's hand value. Stand- No new cards are dealt to player; hand value stays like it is. 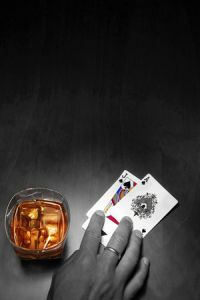 Split- If a player receives a pair for the first hand, s/he can "split" the hand into two, each backed by the amount of his/her original wager. As a general rule, never split 4s, 5s and 10s, but always split 8s and aces. Double down- The player announces a doubling of his/her wager and then s/he is dealt another card. Surrender- Depending on the casino where you're playing, you can give up your hand at the cost of half your bet. Insurance- The player makes a side wager under suspicion that the dealer got a natural. S/he receives an offer of "insurance" if an ace is the dealers up card. However, the chances of the dealer getting a natural are not too great, so avoid insurance betting. This is all you need to know to play a Blackjack game. You might want to learn a bit more about blackjack strategy, of course. The thing to remember, though, is that dealers are nothing special. They follow the house rules and everyone else makes their choices based on what the dealer's visible card is and what cards they have. Beating the dealer is nothing impossible, once you learn some strategies.